Besides being the ideal way to connect different levels of a house; Straight stairs can also be made to look stunning. These stairs are used in every type of building, whether it is a small two-story house or a big villa. When they are custom made to match with your dwelling, they can add a whole new level of sophistication to the house interiors. At Second Generation Wood Stairs, we manufacture and install custom straight stairs for residential buildings in Brooklyn. 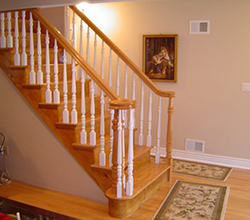 We specialize in designing and manufacturing stairs from high quality wood such as; Brazilian cherry, oak, poplar, maple, cherry, Santos mahogany and more. We build straight staircases in different designs and styles like; floating, against wall, near walls, between two walls or any other design of our clients’ choice. We build these staircases in different designs, widths, and heights according to your house’s requirements. Our experts have vast experience and expertise in engineering the straight staircase meets your requirements aptly. We offer you the perfect combination of creativity, quality, and craftsmanship at competitive prices. Get custom made stairs for your house!